The SEC is investigating any attempts by companies to muzzle would-be whistleblowers, including requiring them to forgo Dodd-Frank bounties. Corporate whistleblowers are getting a boost from the Securities and Exchange Commission. The commission is cracking down on any attempts by companies to muzzle would-be whistleblowers, by asking for firms’ nondisclosure agreements, employment contracts, confidentiality agreements, severance agreements, and settlement agreements they entered into with employees since The Dodd–Frank Wall Street Reform and Consumer Protection Act went into effect. It also wants documents related to corporate training on confidentiality, according to an SEC letter obtained by the Wall Street Journal, as well as “all documents that refer or relate to whistleblowing” and a list of terminated employees. The SEC is looking to see if companies are impeding or retaliating against employees who inform the commission of any wrongdoings, including requiring employees to forgo any bounties, essentially removing the financial incentive to report, according to the WSJ. It is against Dodd-Frank for companies to impede such actions. It was unclear how many companies actually do try to impede would-be whistleblowers, the newspaper wrote, though one pro-whistleblower group, Government Accountability Project and law firm Labaton Sucharow LLP, reportedly wrote the SEC in 2014 that “corporations have become increasingly bold at defying, and creative in circumventing” the Dodd-Frank rule. The 2010 law created the SEC’s whistleblower program, which enables tipsters to receive between 10% and 30% of the penalties if their information leads to an SEC enforcement action with sanctions of more than $1 million, the WSJ wrote. Whistleblowers have “flocked” to the SEC program, providing 3,620 tips on potential securities-law violations last year alone, a 21% increase from 2012. Indeed, one tipster received an award for more than $30 million last year. 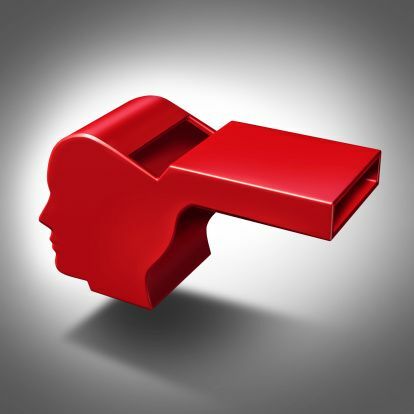 Other governmental entities, including both the United States and New York attorneys general, are working to establish similar bounty programs for whistleblowers, according to the WSJ.